When we travel I usually spend a lot of time finding the perfect hotel for us to stay, whether it be a bed and breakfast, a small boutique hotel like our hotel in Bangkok, or a larger hotel with more amenities; whatever feels right for the destination. However, since our recent trip to China was a package deal with smarTours and included all airfare and hotels, I had no control over our Beijing and Shanghai lodgings. I feared we would be staying in very sterile, American-style hotels for our time in China. 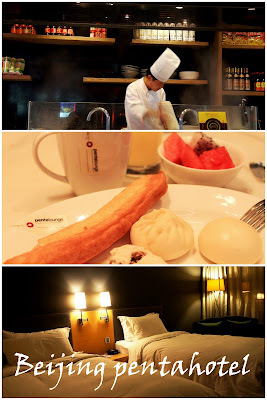 However, the pentahotel Beijing surprised me with its warm, fun and comfortable vibe and its unbeatable location. We arrived in Beijing late at night after flying for over 12 hours, so we were exhausted. While we usually don’t eat lunch or dinner in our hotel restaurants, we made an exception the first night because pentahotel Beijing has the Noodle Bar, a contemporary take on a traditional noodle shop. It was so nice to be able to drop our luggage in the room and go downstairs for a nice hot bowl of comforting noodle soup before hitting the sack. The soups were hearty, filling, and flavorful as well as inexpensive, and made with knife-shaved noodles which were shaved in front of us by the chef. Knife-shaved noodles at pentahotel Beijing's Noodle Bar. Brothy noodle soup at pentahotel Beijing's Noodle Bar. One meal we do eat in our hotels is breakfast, especially when it’s free. But if all they had served was American or Continental breakfast fare, I would have been pounding the chilly streets for dumplings in the morning. penthotel Beijing’s buffet breakfast is quite large, with much to choose from no matter your breakfast tastes. They serve freshly cooked eggs and omelets, bacon, pastries, cereals, noodles and fried rice. I even saw some hotel guests partaking in the green salad for breakfast. But my favorite breakfast choices were the traditional Chinese fare of dumplings, which included sweet pork, brown mung bean, and cabbage filled dumplings, youtiao, which are fried breakfast sticks similar to churros except not sweet, and fresh fruit, including watermelon, cantaloupe, and dragon fruit. Breakfast of dumplings, youtiao, fresh fruit, tea and juice in the pentalounge. pentahotel Beijing prides itself on being an un-hotel. Rather than having a formal lobby with attached restaurants, pentahotel Beijing has a multi-purpose lounge which is a very open space with a bar in the middle and tables all around. This provides for a very relaxing atmosphere and we always felt welcome to take our time over breakfast. The reception desk is unimposing and tucked in a corner (and is where you’ll want to go to change money). The pentalounge is open and spacious and surrounds the central bar. The rooms are no-frills but are clean, contemporary, and functional. The bed was surprisingly comfortable with a white down comforter and down pillows. Wi-Fi is available in all rooms and throughout the hotel, and the rooms contain necessary amenities such as in-room safes, hair dryers, iPhone docking stations, and more. We also never needed to use our power converters because the room had universal outlets. so we were playing June and Ward Cleaver with our two double beds. pentahotel Beijing is also in a great location. The hotel is in the Dong Cheng District, in the heart of Beijing, just one metro stop away from the Forbidden City and two stops from Wangfujing Snack Street. Chongwenmen Metro Station, a transfer station on the convenient inner loop line, is just a short block away. If you’re brave enough to tackle Beijing's busy streets, pentahotel Beijing also provides bicycles for hotel guests to use free of charge. We didn’t have a chance to try the pentafun bikes, but one of the other smarTours guests did and had a great time doing so. The pentafun bikes come with maps to identify nearby attractions. pentafun bikes available free of charge to hotel guests. pentahotel Beijing, while not the cheapest place to stay in Beijing, is very reasonably priced by American standards. If we had booked our rooms directly with the hotel for the month of November, the cost would have been around $115 USD per night. I have heard of small authentic Chinese places that have rooms for around $40 per night, but if you are looking for a hotel with personality but also amenities, penthotel Beijing is a great choice. In addition to the location in Beijing, pentahotel also has locations in Shanghai and Hong Kong as well as 15 properties throughout Europe. They expect to have 80 properties open by 2020.